Matt Patricia reacts during the fourth quarter in the AFC Divisional playoff game against the Tennessee Titans at Gillette Stadium. MINNEAPOLIS — The omnipresent No. 2 pencil dangled behind his right ear, poking out amid a forest of black curls that spread out underneath what looked like a beanie. 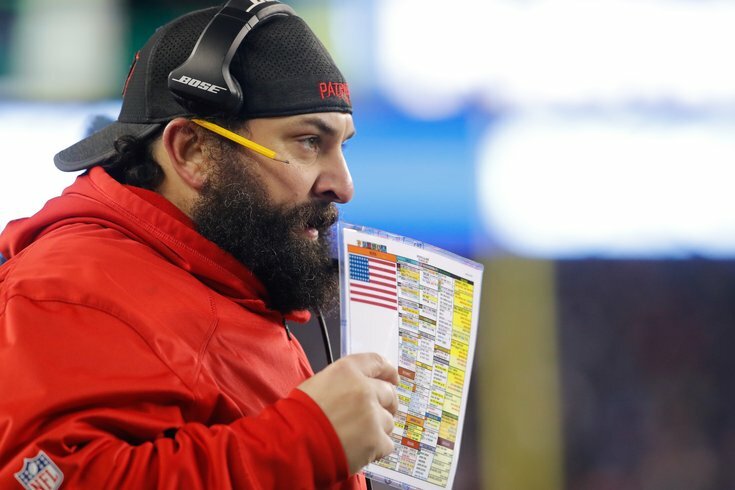 Matt Patricia is a round, furry bear of a man with a pleasant disposition and a calculator for a brain. It looks like the New England Patriots defensive coordinator will be heading to Detroit, as the Lions’ new coach, but his one last assignment before he brakes free from the Bill Belichick coaching tree is battling wits with Eagles’ head coach Doug Pederson this Sunday in Super Bowl LII. Sitting in a drafty basement area of the Mall of America in blue shorts, Patricia Thursday addressed the media about his favorite new subject at the moment — the Eagles’ offense. Patricia, who possesses a Bachelor of Science degree in Aeronautical Engineering from Rensselaer Polytechnic Institute, revamped what was arguably the NFL’s worst defense through the first four games of the season, giving up an average of 32 points a game, into one of the NFL’s best. The Patriots don’t win so much with overwhelming talent as they do with an overwhelming scheme. And this chess match with Pederson is something Patricia is really looking forward to. In fact, the 43-year old seems to thrive off of it. “I don’t think the Eagles’ offense has really changed [following Carson Wentz's injury],” said Patricia, whose defense has surrendered an average of 13.7 points over the last 14 games, including the playoffs. “If you look at it, it’s a very consistent offense. They have a system in place that they have been able to keep and improve on, and I think they’ve done a great job coaching. Patricia vows he will see something new, possibly a few things new that the Eagles haven’t run at all this season. He almost guarantees it, projecting Pederson’s unpredictability. “It’s [Pederson’s unpredictability] and the Eagles’ ability to adapt, which makes them so good,” Patricia said. “Because they have such an experienced package here, from an offensive perspective, they’re not locked into doing just one thing. Once they see what you’re doing defensively, they can move into a different direction pretty quickly. Patricia said his biggest concern is when the Eagles are in the red zone. That comes from Pederson running misdirection plays. “They have a great scheme down there,” Patricia said. “You’re focused on one area, and they really attack you in a different area. They do a great job with their personnel and they do a great job of mixing their different offensive personnel groups. So you might get similar concepts, but the window dressing is going to look different. “The way they line up and the way they use their personnel, you may not have seen it before. They also mix in some plays a little out of the box, which we saw against Kansas City a few years ago. We were like, ‘Okay, we haven’t seen that before, that’s a new play.’ That’s something unique. At that point, you have to try and do the best that you can to react to it. “It’s something you haven’t practiced before or seen before. That’s where I think they do a great job every week. They find something that you do defensively, maybe putting in a new play to attack that that you haven’t seen them do. Obviously, with a two-week window, they’re going to be able to do that more efficiently now. That’s what makes them so difficult down there, along with having great players.